Today we are visiting the Eiffel tower! WOW, that was something! 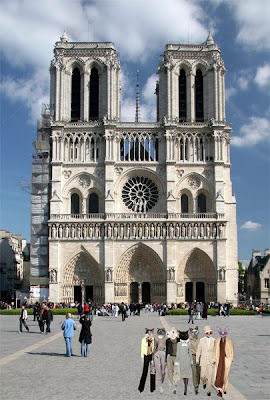 And now we will go and see Notre Dame. And tonight we are having dinner at the famous Deux Magots! Come back tomorrow for the Party at Versailles! Oh what fun you all are having! 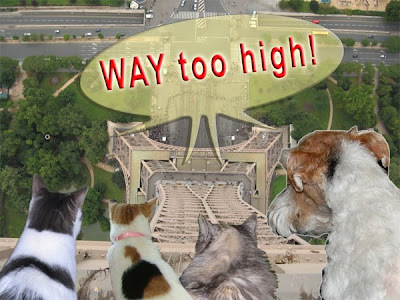 We agree...on top of the Eiffel Tower is waaaaay too high! Oooh, that's kinda high, isn't it! Looks like you're enjoying this trip immensely. Have fun! 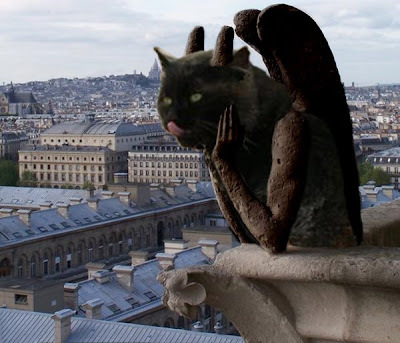 Oh the gargoyle, I don't think that it looks like me at all. And talk about feeling superior being so high up over all of the small humans on the ground, wow! That was neat. You guys sure are making this retirement a big deal. If I had known that I would have been taken to Paris I would have retired sooner. Love the gargoyle. Agree, I like high, but the top of the tower is just a bit too high. Looks like a wonderful time was had by all!! That pawtwait of you is a tweasoowe! Wasn't that seafood dinnew the best? Love the gargoyle! 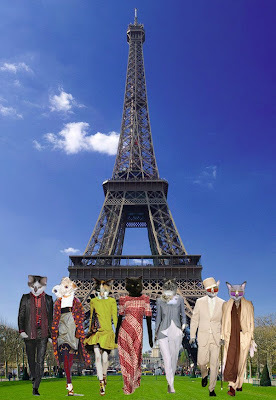 Looks like you all are having a blast in Paris. Love the Eiffel Tower! you are sooooo styley!! a purfect bash for your retirement celebrations!! 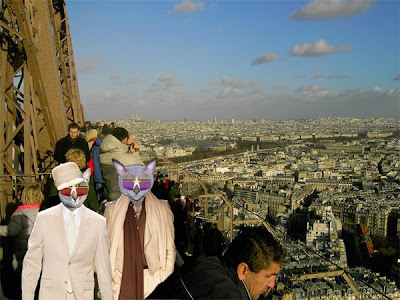 We know that cats are reputed to always land on their feet, but we are SUPER glad no one fell and tested that premise from the top of the Eiffel Tower. We were pressing inward and gripping with our paws as we looked at you all so high up! 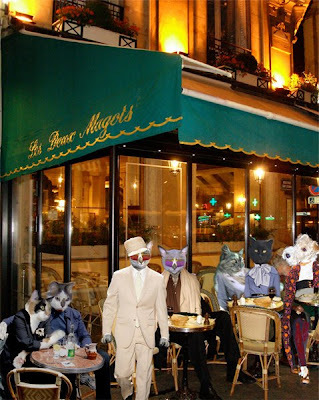 And ... the Les Deux Magots? 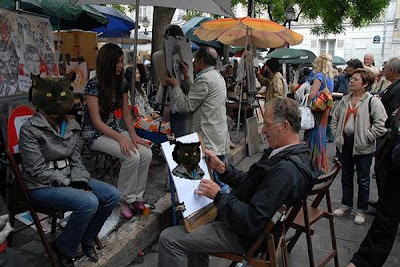 Maybe you'll see the spirits of Camus or Picasso or Hemingway or Jean-Paul Satre! What an amazing place to gather and eat!!! Now each time I see a gargoyle I shall remember this one. There are plenty of gargoyles where I am, but none as dear to my heart as this one. wow you guys really know how to party!! I might have to retire soon! Hmmm...now I know why muzzer has retired. Great pawty and congratulations to Sassy on her successful retirement. I didn't even know this place existed until Asta sent me. I can't believe all that you cats are up to. 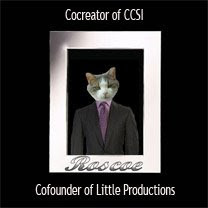 I also never knew that cats were such snappy dressers. Sheesh. All the ones in Master Chew Sits are nekked. Maybe you need to come to the US and educate them. Is Asta like an honorary cat maybe? Doesn't anyone know that Wires get along great with cats? If we don't, nobody told me cuz I grew up with my sis Echo, even let her give me baths. Anyway, congrats on your retirement Sassy! I love a good khlimb! It looks like an amazing retirement party. I hope you enjoy retirement! WOW! What a party! You cool cats are definitely jivin'. A most excellent adventure for sure. Yes, the Eiffel Tower is waaaaay too high. I was afraid for my breakfast to come out so I didn't look down. What a wonderful and exciting trip! 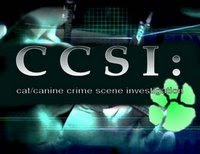 Crime - the final challenge! and boldly solve what no other detectives can solve. 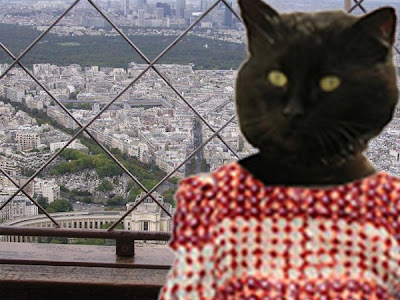 Sassy Retirement Day 1: Arrival in Paris!